Mix all the of the salts in the large mixing bowl and blend thoroughly. Sprinkle the dried herbs into the salts. Add 10 drops of lemon essential oil to the mixture and stir thoroughly to disperse the scent throughout the salt and herbs. Use the funnel to fill the test tubes with the salt mixture. Larger flowers might need to be coaxed into the tube with the straw or skewer. 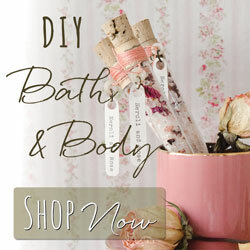 Insert the cork stopper, wrap the test tube with twine, and finish with an antique button or decoration. "With the largest number of art and crafting magazines in the industry, Stampington & Company has every corner of the crafting community covered! 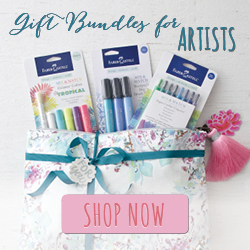 Whether you're just starting out and eager to learn a new technique, or a seasoned artist looking to elevate your craft, there's something for everyone in our family of inspirational paper crafting, artful living, and mixed-media magazines." These kits make great gifts for your mom, sister, or best friend – just don’t forget to splurge on yourself too!! "From spa kits to homemade Christmas ornaments and jewelry making to embroidery, there's something to inspire all your crafting inside these one-of-a-kind DIY kits and gift bundles. These Stampington & Company exclusives can't be found anywhere else, so be sure to grab them before they're gone for good." 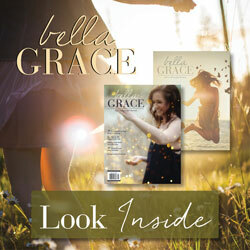 "Bella Grace is a special, 160-page publication devoted to discovering magic in the ordinary. Our aim is to touch the souls of our readers through beautifully penned stories and striking photographs that capture life's beautiful journey. For anyone who is tired of trying to fit ill-considered standards of what beauty is supposed to look like or reaching for unattainable ideals – Bella Grace gives you permission to just go ahead and toss them. Embrace imperfection. Celebrate your messy life. Shine a spotlight on small, everyday moments – they are special, and they are yours. If you are looking for the most creative, inspirational women’s magazine available today – you’ve come to the right place."